Looking to change your tile? Don’t replace it – let South Bay refinish it instead! We make your existing tile showers, tub surrounds, kitchen backsplashes, countertops and floors look and feel new. We fix damaged tile, change the color and permanently seal your grout lines. Your tile will look amazing and be easy to clean! Save up to 50% over the cost of replacing your tile. Avoid the mess and hassle of demolition. 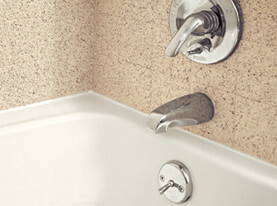 Never clean your grout again – we clean, repair and seal it! Get it done fast – your project will be complete in 2-3 days! Extend the useful life of your surface 10-15 years with proper care and cleaning. Get a FREE Refinishing Service Estimate Now!